Welcome to our website! We are the Evans Family. About our “farm:” We live on approximately 1/5 of an acre located fifteen miles north of LA. When we bought our house in 2004 it was just a house on a grassy lot that had a small but nice front garden with rose bushes and two trees, a crepe myrtle and a one foot tall lemon tree. Since then we have added seventeen trees, put in a garden and pond in the back yard, we have also added chickens and quail, and have become the self-proclaimed fringe people of the neighborhood. If you were to come to our house at any time you would most likely find at least one of us in the kitchen working on something fermented and others of us in the garden either doing something with the animals or planting something new. In the evenings we take part in family dinners. We eat good food and share in a time of being together. Jordan Evans is an engineer at the Jet Propulsion Laboratory. Around our house he is known as a master builder of chicken coops, sprinklers, pergolas, and other weekend projects. He grew up as a city boy that married a country girl. And they are living happily ever after on their “Farm” 15 miles away from LA. Jordan has worked for NASA for most of his working life. To relax he enjoys working in the garden and one of his more recent hobbies is restoring a 1979 Apache Ramada with his daughter Alyssa. He is a very creative and methodical thinker and enjoys talking about what he does. He has given many talks including a TEDx talk about the Mars Rover, Curiosity. Kristina Evans is that country girl and enjoys getting her hands dirty in the garden. She loves to make her garden look nice, and she adores roses. She is the fermenting genius in the house and can turn most every day sauces into a fermented master piece. 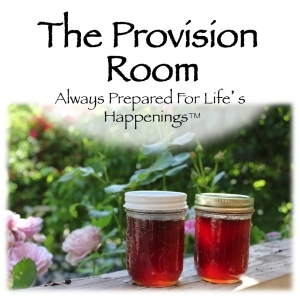 She is co-founder of the Provision Room and enjoys teaching people about using food as medicine. She keeps her faith and family first in her heart and the only thing that second’s those are her love of home, food, and gardening. Anna Evans is the crazy animal lady of the family. Her family calls her the Chicken Lady. You can usually find her in the chicken coop doing something. She is the vet of the family but their is a small problem,she doesn’t have a vet certification, and well, as a matter a fact, she is not even old enough to get one… yet. But that does not stop her! She just does what she needs to do and learns as she goes along. She is not your average young adult and she plans to keep it that way. Anna loves learning and teaching people about her animals, but her favorite thing over all is spending time with her family. Alyssa Evans is the baker. She can make everything from hobbit hole cakes to cupcake dresses. She also enjoys fashion and can sew up a storm. She is very creative and loves to build things with her dad and loves restoring their funky trailer together. When she is at the house she usually is found building, sewing, drawing or cooking. She loves to read and will go on reading for hours if you let her. Alyssa has a bright smile and a lovable heart. She loves her family, her friends, and her cakes!